Best Metronome Reviews - Is it worth for your money? As a music student, you must have heard your teacher hap on practicing with a metronome. If you’re wondering why, the answer is pretty simple. Metronome practice is easily one of the best ways a beginning pianist can improve their skills because it helps you keep time and develop a high sense of timing. You need to learn how to incorporate metronome into your piano practice boost your technical and rhythmic skills. In fact, it’s the fastest and also the most efficient way you can do this. So, in a bid to lend a hand and contribute to your piano success story, we’re bringing you reviews of our top ten best metronomes in the market. Together with our buying guide, we are pretty sure that we can help you find the metronome that’s best for you. The Boss DB-90 is more than just a clicky metronome. It’s an impressive metronome with loads of features that make this metronome one of the best in the market. With a tempo range of between 30 to 250 bpm, you’ve only seen a tip of the iceberg when it comes to what this metronome offers. There are numerous rhythm patterns on this metronome including shuffle, jazz, funk, techno, blues, country, house, claves reggae, salsa, bossa, rumba and lots more. And you can also subdivide the accent and beat into different kinds of beats for different meters. What’s more? This thing talks. It comes with a human voice counting feature which can help you mark beats easily. Now, on this metronome, you’ll find all kinds of inputs and outputs. And, of course, this also comes with a MIDI input. And so this means that you can sync your metronome with an external sequencer. Approximately, this device weighs about one pound and is also pretty small sizes as well. Also, it works either with an AC adaptor (which is included) in the package. But just in case, you can’t access power at any given time, this also operates with batteries. So, you’ll be fine. Another thing we love about this metronome is that it comes with its built-in speaker. However, you might need this to be louder. In that case, you can connect the metronome to an external speaker thanks to the inputs and outputs here. This is one metronome with several bells and whistles available. Comes with built-in speaker and can also be connected to an external speaker. Can be synced with MIDI. Tempo range: 30 – 350 bpm. 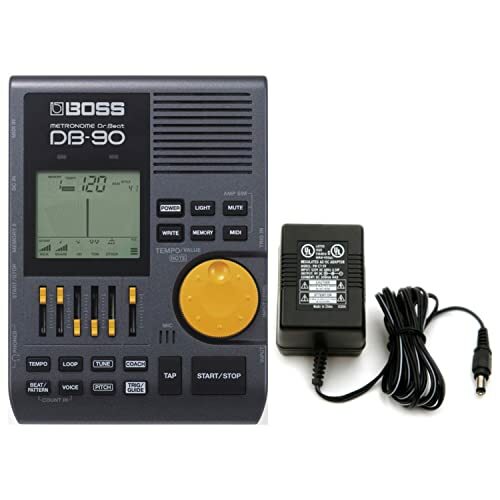 The Boss DB-90 is probably the most popular metronome in the market. And the company itself has quite a healthy reputation among pro drummers worldwide thanks to their plethora of high quality products. Now, straight into the features of the Boss DB-90…. 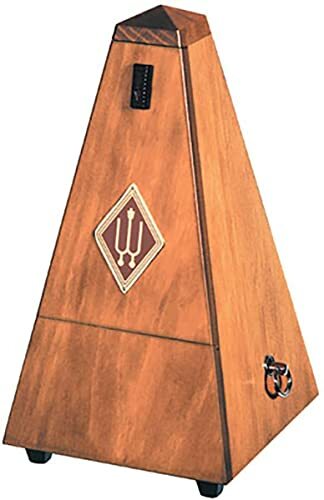 This metronome is quite unique because it comes with all its features adjustable. That is, you can adjust literally everything like subdivisions, clave patterns, programmable time signatures, and sounds. Also, you’ll be impressed to find that there are about 4 different click types which also includes a human voice count as well. We especially love this feature because it helps you keep track of the down beat quite easily. Now, no doubt, this metronome is a bit pricey. And it’s made even pricier because the power supply is not optional. 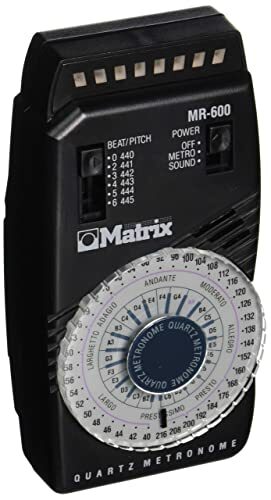 However, this still remains one of the best metronomes in the market. And loads of pros have come to depend on it. Moreover it comes with a host of MIDI integration features. So, you’ll be able to play with a lot of beat programming here. Lastly, the light display is also quite handy. Some people think it only lights up the display for a bit. But it can actually stay long for as long as you want. Simply hold down the light button after powering the unit. The Boss DB-90 is easily one of the most advanced metronomes in the market. And though it does cost a bit, it will definitely jack your practice up something sick. Probably the most advanced metronome in the market currently. Tempo range from between 30 to 350 bpm. 50 memories with human voice count. Operates via AC/DC power supply as well as batteries too. Can be mounted on a cymbal stand or on a microphone stand. Not much by way of instructions on how to use the device. The Wittner 813M is really easy to use and it’s also quite accurate too. 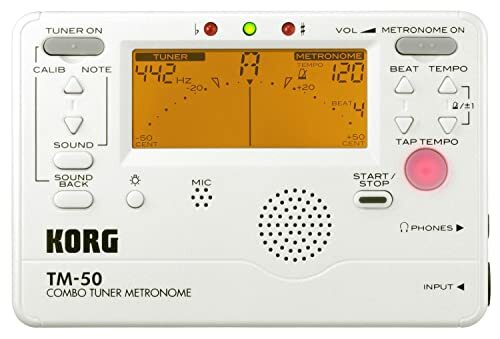 Also, the metronome here is from a reputable company. So, when it comes to the brand behind this metronome, you can trust. 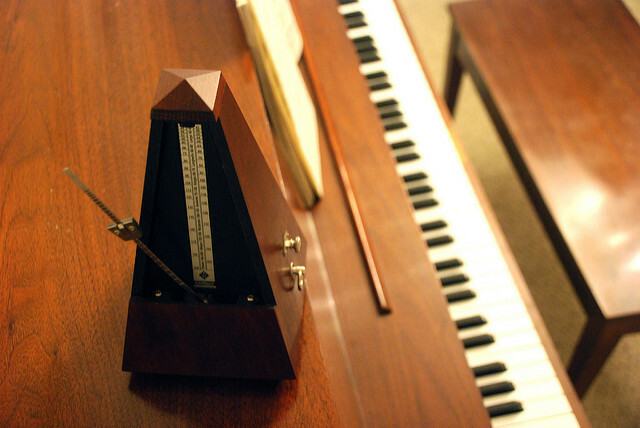 Let’s begin with the looks, this metronome comes with a really vintage look which we like. The casing is made of wood and looks really well made and solid. It’s stained to the color that it currently depicts. And altogether, we can say that this metronome looks pretty nice and high quality. As for the internal parts like the regulators and cog wheels, those are made of plastic. Understandably, anyone would be scared considering that plastic isn’t exactly heavy duty. But though plastic is fragile, it could also make the movement pretty smooth. Plus, with plastic parts, this comes at a much more competitive price than some of the other metronomes in the market. Now, one feature that many customers liked in this metronome is the bell or the pendulum if you may. 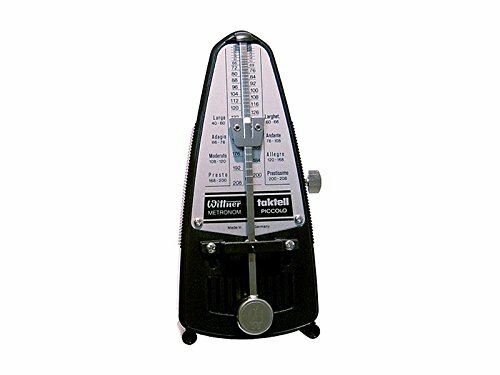 For this feature alone, many customers felt this metronome was worth the price as the bell added to the look and function of this metronome. Lastly, this metronome is accurate, to a large degree. However, there were a number of complaints about the calibration going off. And so, the metronome might tend to go off beat a bit faster than other quartz metronomes. Nonetheless, if you simply need something steady and absolute precision isn’t so important to you, this will serve. 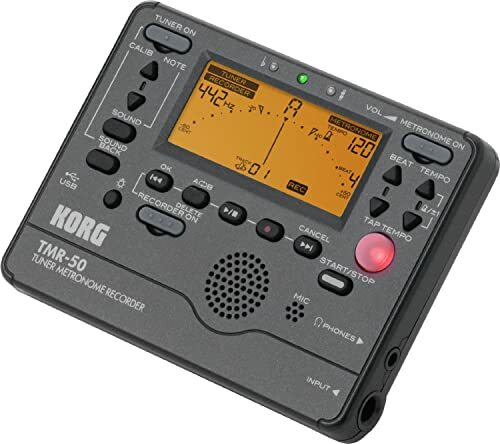 The Korg TM50PW is a tuner and metronome combo. You can either use both functions independently, or simultaneously. It’s an all in one instrument and literally all you need to practice your pitch and rhythm. The latest model in the TM series, this device also comes with a backlit display. And this helps to improve the visibility of the LCD display on this device. The needle-style LCD gives this combo instrument a fantastic response. And it also helps to make give the tuning a more precise accuracy. For the first time in this series, Korg is adding a new function – the Sound Back function. What is this Sound Back function? Well, the Sound Back function helps to generate a reference tone which sounds closest to the input sound. This way, you refine and develop your sense of an accurate pitch easily. This tempo comes with two options for use. There’s the “pendulum steps” which causes the tempo to increase or decrease in a numerical style similar to a mechanical metronome. On the other hand, you can also go with the “full steps” where the tempo range falls between 30 and 252 bpm. In this case, the temp follows one-step increments. Furthermore, there’s also the tap tempo input which requires you to simply press a switch. And by doing that in time to the beat, you can select any tempo you like. Lastly, this device comes in two colors. You can either choose the cool black, or you could go for the fresh pearl white. The TM50PW is lightweight, with a longer battery life, plus a stand for free standing mode. LCD display is backlit with huge, legible display. The instruction book here isn’t easy to understand for a beginner. We’ve already reviewed a Wittner earlier today and both metronomes are kinda the same. Only difference here is that this does not come with a bell like the first one we reviewed. But besides that let’s see what this metronome has to offer. First of all, it comes with a wooden casing which makes this a real beauty. It’s definitely going to add a bit of character to your space when you use this. Plus, it is quite durable and a couple of customers expect to use this for a very long time even passing it on to their children and grandchildren. Of course, for wood, you can expect to spend a bit more but then it’s totally worth it. From the looks, to the quality this is a metronome you want to have. The quality of craftsmanship Wittner put into this is quite impressive as most agree. This ticks on time and is also quite easy to use. Plus, there are several finish options you can pick from. Comes in a superior wooden casing. Might be a pricey for some. In our review today, we have looked at the Korg TMR50PW. And now, we are set to review the TMR50BK. If you recall, we did mention that the TMR50 comes in two color options. There’s the cool black and pearl white. The first TMR50 we reviewed was the pearl white finish, but this is the black. The TMR-50BK looks really cool and comes with a built-in mic and a built-in speaker. This means that you can record whenever you have to. Plus, there is the input jack and the headphones jack. With these features, you can record onto your device using a contact mic. And then you can playback your recording using your headphones connected to the headphones jack. Another feature that really impresses us on this device is the Loop Play function. With this function, your device plays any specified aspect of your recorded data as often as you want. With this, you’ll be able to practice to any specific phrase for as much as you want. Moreover, this is a tuner, recorder, metronome combo. And what’s really amazing is the fact that you can choose each to function separately. Or you can decide to use all of them at once for a more effective practice. Furthermore, this device comes with a stand so it makes the device easy to use in the free standing mode. It doesn’t seem to be super strong, though. But it is still quite good when it works either way. Lastly, we like how this device comes in a slim and lightweight design. This makes the TMR50BK pretty portable and easily versatile too. It can stay just about anywhere and you can toss it into your gig bag too. Comes with a backlit LCD display. Features a Loop Play function. Tuner, metronome and recorder can either function separately or simultaneously. Features a stand for free standing mode. Metronome volume is not high enough. The Matrix MR600 brings a whole lot to the table which we are going to be taking a look at in this review. It’s a quartz metronome which assures you of a certain level of precision. Plus, it also comes with a dial setting. In addition, this comes with an extra range of downbeats. Plus, this metronome looks aesthetically impressive with its pendulum that comes LED simulated. So, in all, you’re looking a metronome with the classic metronome sound but a more modern display. In our research on metronomes, we encountered a number of customers who did not like the digital beep so much. If you’re one of such customers who can’t afford to sacrifice on that sound, then the Matrix MR600 is the metronome you want to get. Instead of a digital beep, this comes with the classic sound that we all love about the metronome. Plus, the Matrix uses its different green LED lights to simulate the feel of a pendulum. Then there’s the red light which you find for the downbeat. And as much as we love the mechanical sound of this metronome, we love even more that this metronome is quite easy to set up. This makes the device quite easy to use even for beginners. All you have to do is to dial your device to your preferred tempo, and switch to your downbeat. Once that’s done, you can get playing immediately. If you want something simple, no bells or whistles, the MR600 might just work. Simple layout but still quite customizable. Pendulum comes with LED lighting. Seems a couple of customers don’t think this lasts long enough. 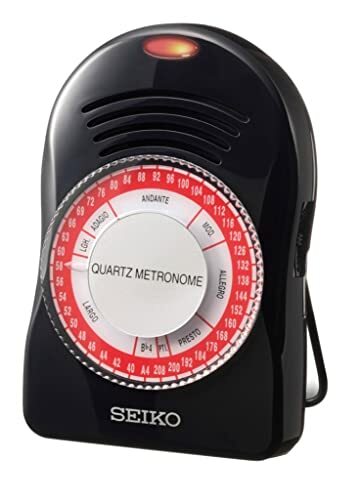 Here’s another simple, straightforward, and easy to operate metronome, the Seiko SQ50-V. It’s a quartz metronome just like the Matrix MR600 and it comes with loads of new features you’d find easy to use. The tempo dial is easy to operate. And the device also comes with two selections which help to click tones both high and low. So you can see that Seiko tried to make this a pretty basic metronome. In summary, you’re getting a product that’s super easy to use with two beat sounds, two tempo sounds, as well as a large LED display for enhanced visibility. The tempo range here is fairly wide from 40 to 208 bpm. Plus, with this simple metronome also features different click tones for the high and low. And then there’s the temp dial also which is pretty easy to use. You’ll be able to adjust your tempo setting with A=440. The red LED light is pretty handy as it shows you the beat. But that’s not all, it can also work with the click sound to make it easier to keep the beat. Also, with the earphone jack, you’ll be able to achieve a private rehearsal with this device. Now, this is a dial metronome so if a digital metronome doesn’t work for you, this is a good choice. And then with simple volume controls and other features, this metronome makes a fantastic gift idea for all kinds of musicians. Volume comes with controls which makes the volume adjustable. Portable device that can fit on an electronic piano. This comes with the digital beep rather than the classic click. Tempo range seems a little narrow, does not reach 250bpm. Wittner is a German brand and so you can expect a high level of quality here. Like other Wittners we’ve seen so far, this is one gorgeous instrument. But it also comes in a really teeny size like a cute little Piccolo and it‘s also somewhat competitively priced. 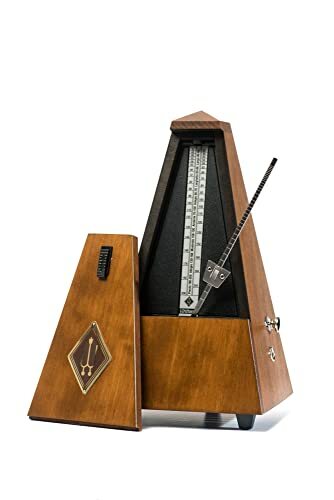 We recommend this metronome for any musician who needs a portable little device to move around easily. Or something with a tiny footprint that will take up only a small space on your piano or something. This device is also quite easy to use even for beginners. All the parameters do not require so much to set or adjust which is a good thing. But we love it even more that this comes with the classic metronome click. We understand that some people simply can’t stand the digital beep. And with this device, you won’t have to put up with that. Plus, the clicks here are pretty loud, so much that some people even have a problem with it. This is a winding metronome, another reason most people like this device. The whole retro thing here seems to be working for a lot of customers, obviously. Overall, we are looking at a nice, simple, retro metronome that’s highly durable and is also quite the looker too. Compact and lightweight and can stay just about anywhere. Comes with the mechanical click rather than the digital beep. You’d have to keep winding this every now and then. A bit too loud for some users. The Boss DB-30C is a much simpler and a more affordable metronome than the Boss DB-90 which we first checked out. It’s a pretty basic device, but it is well designed nonetheless. Besides the design of this device which we love, this metronome comes with an incredible capacity of 17 beats for each measure. This allows the metronome to give all kinds of styles and patterns with the beats. As for the headphone output, it helps you achieve a quiet, private rehearsal. And being so small in size, you can carry this conveniently anywhere either in your gig bag or in your pocket. It sure is helpful that this goes off on its own after use to help you conserve some power. Now this metronome is bursting with features containing 24 variations, 9 patterns. So, you have more than enough when it comes to combinations and rhythmic styles to attack those odd-time signatures, and Latin rhythms. We also love the tap tempo feature as well as the internal reference tones which come with 12 semitones. And to make these features even more enhanced, this metronome also features value controls, tempo controls, note/pitch controls, power controls, plus beat and rhythm and beat controls too. Comes with a clip to attach to a stand. Comes with a number of controls so you can work with your Latin music pieces. Battery isn’t exactly long lasting. What exactly is this metronome we speak of? If you’ve ever been to a music practice room, then you’ve probably heard a strange “tick tick” sound. And if you were able to trace where the sound was coming from, you probably found a curious little box producing those clicks. And then you probably also saw musicians following in hot pursuit trying to keep up with this strange instrument. With all the back story, do we need to explain that those instruments are metronomes? We guess not. Music has never been a loner. And so everyone that practices music must learn to work with other people or groups of people. Yes, even the soloist. You can’t really be a soloist without the help of backup singers or backup orchestras now, can you? Now, if this cooperation is going to be seamless, then it is fundamental that everyone plays/sings at the exact same speed. What musicians would call “on time”. The good thing is that, for most people, there is that inbuilt time keeper in us that helps us work with other people, at least at the most basic level. But as skills advance, and ears sharpen, one might begin to notice little discrepancies here and there. And a group might no longer sound as “together” as they used to. It’s for times like this that the inventors blessed the world of music with metronomes. 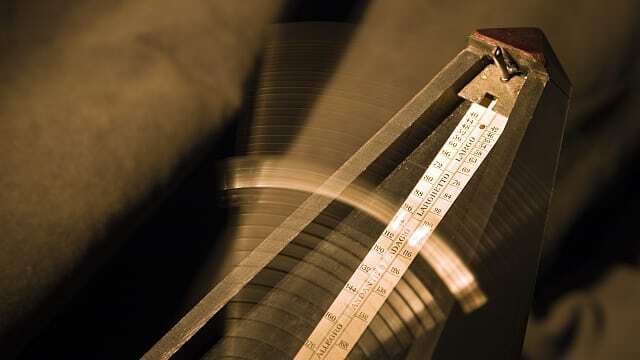 Metronome practice remains one of the best ways to improve your timing. And so, if you haven’t been practicing with a metronome, you best begin now. That said, if you’re looking to get your first metronome, there are a few other things you should know. Metronomes come in different types. 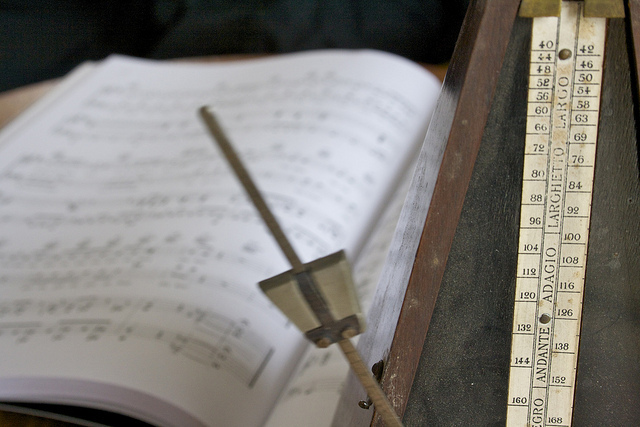 Plus, there are some criteria you need to factor into your list when getting a metronome. We’ll be looking at both aspects in the next two subs. For want of space, we will only be listing the types of metronomes. You can do your own personal research on them later. Plus, some of them already give off their functions from their names alone. Credit card digital metronomes (really thin, flat metronome like a credit card, hence the name). Of course each of them has its pros and cons. So, factor that in when choosing any particular one over the others. 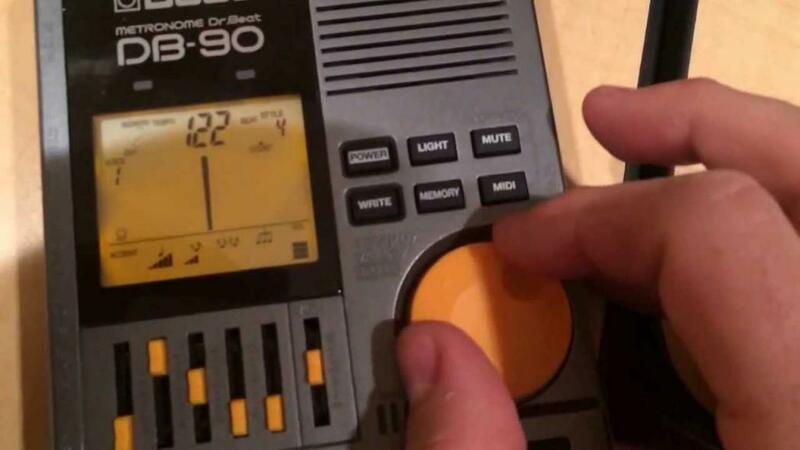 Audio: What kind of sound do you want to hear from your metronome? Some people prefer the mechanical click. But there are also clicks and beeps. It all depends on you and your preference. Visuals: This isn’t just referring to the looks of the metronome, although that might be important to some. We are looking at how the metronome indicates the beat. Traditional metronomes usually use a pendulum but digital metronomes use LED light. Tempo Change: Changing between bpm (beats per minute) or tempi should be easy. You’re not doing the legendary “rocket science”. Size: Is portability a big deal to you? Is a small footprint an absolute must? Consider these too. Functions: What other functions do you want included on your metronome like a tuning note or subdivisions? Are they on your preferred metronome? Power: Some metronomes are AC/DC powered, others work with batteries. We had a variety of metronomes up there. We hope our buying guide helped to lessen the burden of choice even by a little bit. Cheers! 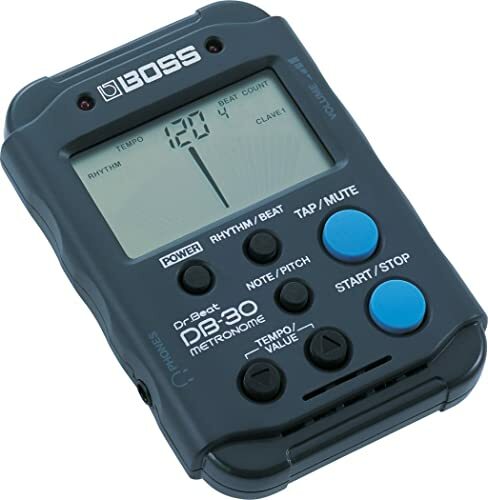 The Boss DB-90 Metronome is easily the best metronome in the market. In the words of the manufacturers, and we agree, this is the most advanced metronome in the market. There are just so many features that will impress the pro musician. Yes, it is pricey but then again all good things come at a cost. 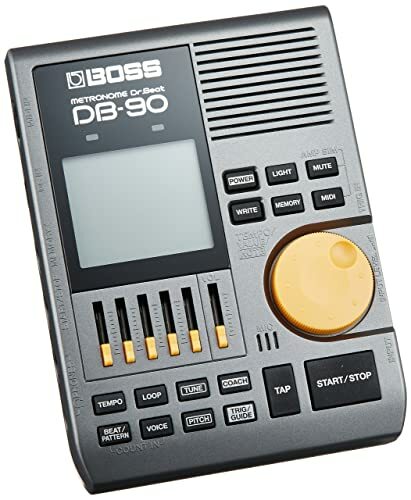 And then again, we are yet to see a metronome like the Boss DB-90 that works so excellently. You really do get what you pay for here.